Located on McClure Dr off Gulf Breeze Pkwy, Extra Space Storage serves residents of Gulf Breeze, Oriole Beach, Pensacola Beach, Tiger Point, and more. Locals will recognize our facility just west of Baptist Hospital and Gulf Breeze Hospital. 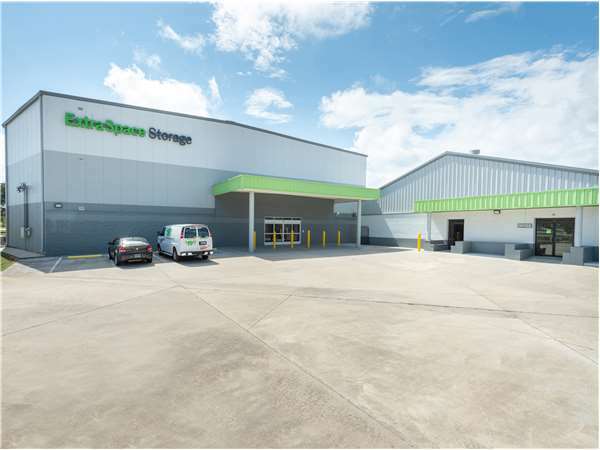 Extra Space Storage on McClure Dr can handle both residential and commercial storage needs in Gulf Breeze with a large selection of storage units, vehicle storage, climate-controlled storage, and more! With units ranging from 2x3 storage lockers to 12x35 outdoor vehicle storage spaces, it's easy to find the storage space that works for you. We also have unit features like first-floor access, drive-up access, and elevator access for your convenience! Extra Space Storage is very clean, secure and safe. We were very pleased with the professional service upon arriving to the facility. We didn't have a lock and were able to purchase one very reasonable on site that day. I would highly recommend!! While I enjoy the cleanliness and security provided for my belongings, I'm frustrated by the $22/month rate hike after only 6 months of utilizing the facility. I feel this rate hike, or at least the potential of one, should have been discussed with me when I signed the contract, or sooner than two weeks before the rates go up. I also found the reason given for the rate hike not sincere, but merely an excuse to raise the price. My wife and I are now considering alternative options. Excellent location! Staff informative and professional. All areas clean, well-lit & maintained. The employees here are very helpful & nice. The entire process was smooth & I left feeling very informed and that my hard earned money was well spent for a safe place for my most precious belongings! I came here on a referral & I will definitely recommend it to others! Please pass on to Cathy, Extra Storage Space location on McClure Dr. in Gulf Breeze, Fl 32561, how wonderful her service has been to my family and me. She never fails to answer my questions with a smile and provides comfort to me when the business changes hands. I've been a customer for many years, but have only enjoyed your company for a short while. Please know, you have an outstanding staff representing you in GB. Proud user of storage unit #2032 (and others over the years)! Drive south on the Pensacola Bay Bridge. Continue straight onto Gulf Breeze Pkwy. Pass Gulf Breeze High School. Turn left onto St. Francis Dr. Pass Baptist Hospital. Take a slight left to stay on McClure Dr. Our facility is on your right, before Publix. Drive northwest on Pensacola Beach Rd. Stay right at the fork and merge onto Gulf Breeze Pkwy. Make a U-Turn at the entrance to Baptist Hospital. Drive west on Gulf Breeze Pkwy. Turn right onto St. Francis Dr. Take a slight left to stay on McClure Dr. Our facility is on your right, before Publix. Drive west on Gulf Breeze Pkwy. Pass Baptist Hospital. Turn right onto St. Francis Dr. Take a slight left on McClure Dr. Our facility is the first driveway available on your right. Drive east on Shoreline Dr. Turn right to stay on Shoreline Dr before Gulf Breeze High School. Turn Right onto Gulf Breeze Pkwy. Turn left onto St. Francis Dr. Take a slight left to stay on McClure Dr. Our facility is at the first available driveway on your right.